Back in 2009, Kimhead and I embarked on a girl's history lesson adventure to Washington DC for a long July 4th weekend. It had been years since I had been there, and I was instantly reminded why it is one of the best cities in the whole of our country to visit. We crammed in anything and everything we could... museums, restaurants, subway rides looking for our "subway soulmate." We walked more miles than I can recall and were drenched in sweat every evening from our treks in the heat. 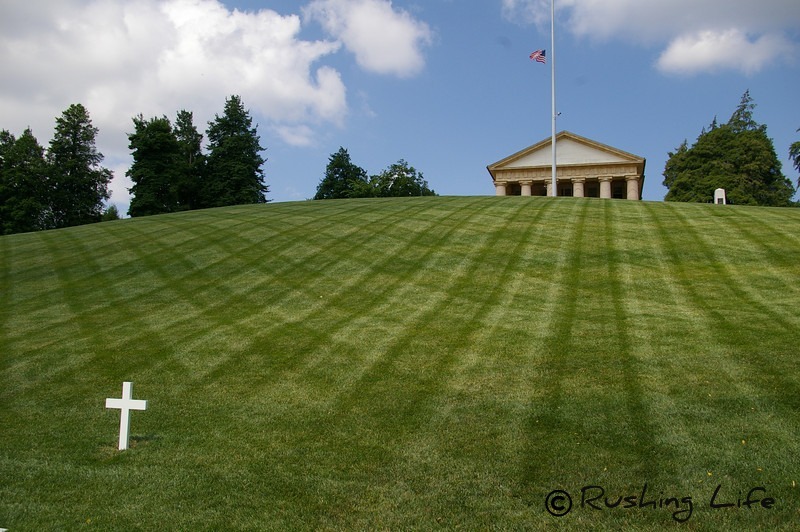 One of the "must see" sites is definitely Arlington National Cemetery. You'd pretty much have to be an idiot to not realize this photo is of Robert Kennedy's grave. I remember loving that time in Washington DC so much that I couldn't help but think ahead to the time when I could go back with Puff and our children. Maybe we can take little Kennedy to visit the graves of the men she was named after. It would be a dream come true.